A Delaware County girl made a super‐cali‐fragil‐istic‐expi‐ali‐docious memory on a trip to Disney World recently. Marceline, who has clearly seen Mary Poppins a time or two, shows Bert how to perfect his moves from the film. 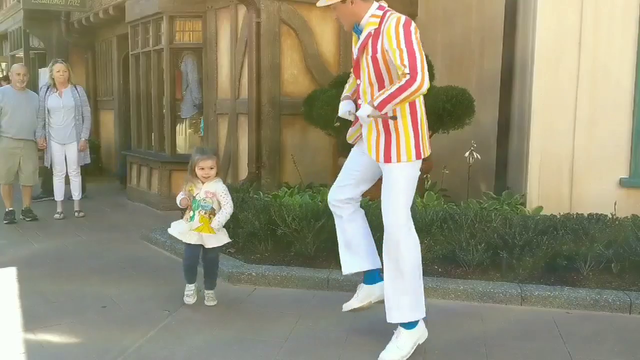 She toddles and kicks with Bert before she ends with a spectacular and totally planned fall. To stamp the memory forever, Marceline and Bert pose together for a picture. Marceline’s mother, Amanda, said the adorable video is starting to get a lot of attention. With the recent revival of the Mary Poppins series in the 2018 movie “Mary Poppins Returns,” perhaps we will see the 2-year-old on the silver screen in the near future.